Danville Services of Arizona has been providing essential, comprehensive support services to Tucson residents with disabilities since 2002. We support individuals with intellectual and/or developmental disabilities, as well as those with co-occurring mental health, behavioral and complex medical support needs. 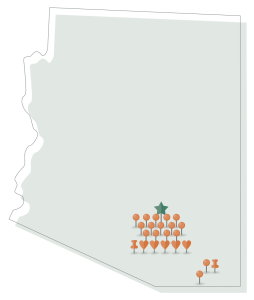 We provide an array of residential, community integration and related support services throughout the Tucson and Bisbee areas. All of our residential settings receive 24-hour staffing support, while our intensive medical homes have licensed medical staff on premise 24 hours per day. We also have the capacity and experience to support individuals with complex nursing needs up to 24 hours per day in our small, neighborhood-centered homes. Danville has established itself as an industry leader in the state of Arizona by developing a reputation for excellence and by being a strong, vocal advocate for change and for the advancement of service opportunities for people with disabilities.